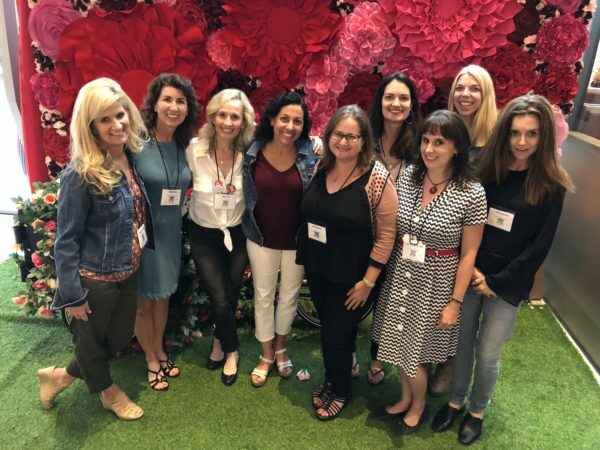 This weekend, I geeked out at the Society for Children’s Book Writers and Illustrators Summer Conference in Los Angeles, California. With homework and deadlines approaching, I was nervous about attending, wondering whether I could really afford to lose valuable study time. And of course I felt some Jewish mom guilt to leave my family less than a week after my 16-year-old returned from a summer program. Fortunately, I got a lot of reading and writing done on my 6-hour flight (with an additional hour on the runway). And while three full days of panels, workshops and keynotes with an amazing faculty of authors, agents and editors kept us busy, it was unbelievably inspiring and well worth every minute. Besides making new friends, I spent quality time with a wonderful group of supportive and loving writer friends (several pictured below). I was also excited to see recent VCFA graduates and fellow students I had gotten to know—at least a little bit—during my recent grad school residency. Two even won awards—an Emerging Voices award for my fellow firstie at VCFA, Lakita Wilson, and a graduate award for recent VCFA grad Jessica Lee!) So, in many ways, coming to LA for this incredible conference felt like coming home. As always, I took full advantage of the conference, attending all but one keynote. The speakers were wonderful, especially Andrea Davis Pinkney and Brian Pinkney who put on a spirited and enjoyable show (such talent they both have), Libba Bray (a real writer’s writer), Lynda Mullaly Hunt and Bruce Coville (way to make me cry while touching and inspiring me), and Lois Lowry, the 81-years-young author of The Giver (pictured below while signing my book). I can’t wait to read her book about human connection set to launch in 2020. There were so many highlights of the conference—too many to name. But I thought I’d share my top 10 takeaways list (in no particular order). I’m already thinking of when and how to incorporate many of these ideas into my writing/life, and invite my writer friends to do so as well. 10. Daniel Jose Older, author of Shadowshaper: The sound and rhythm of words matter. Read work aloud so you can hear it. Tension is the spinal cord of books. Increase tension by asking What if questions, play with time, add a ticking clock, and/or write your character into a corner that you don’t know how to get her out of. Think of ten scenes that are integral to your novel and write them. Write one sentence at a time. You pass by ideas every single day. When you feel emotion, jot it down (or talk into your phone about it). Write what you’re ashamed of…what you don’t want anyone to know, what you haven’t yet figured out. 7. Andrea Davis Pinkney, author of The Red Pencil: Meet hate with love. Every morning, spend some time thinking of things that make you happy. Then write. 6. Amanda Maciel, author of Tease: Who does your protagonist think she is, and what do other people think she is? What are the expectations placed on her? And who is she beyond those expectations? What’s important to her? Assess everything from her eyes. 5. Libba Bray, author of The Diviners: What is the purpose of your story, the spark that lights the fuse? What answer do you seek? The question is about growth…bringing us somewhere. Push aside vanity and the desire to be liked and write from a deep, vulnerable place. Do not think about how the story will be received. We were never kids’ age in the age of technology. Don’t think about kids through the lens of your teen years. Use the emotions you felt in your childhood years, but learn and understand what their world looks like today. When revising, ask, “Why is this here? What is this scene/chapter/sentence doing here? We confuse our identities with our work. The work is not us. The real goal in creating art is to love the process so much that you want to show up to do the work. 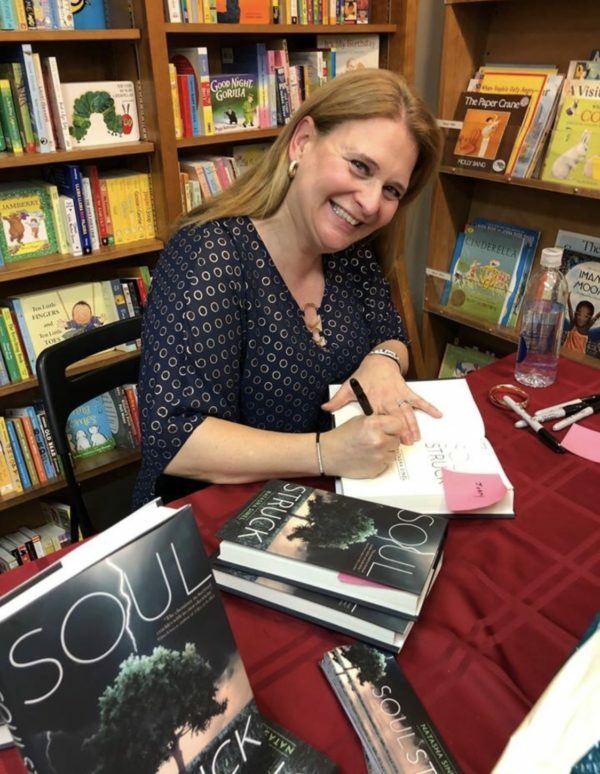 Why do you want to write? Keep asking the whys. Then you’ll understand and it’ll inform your work. Small actions ripple the world and small gestures can be a turning point. Do not start writing books with a message. Start with your own good heart. 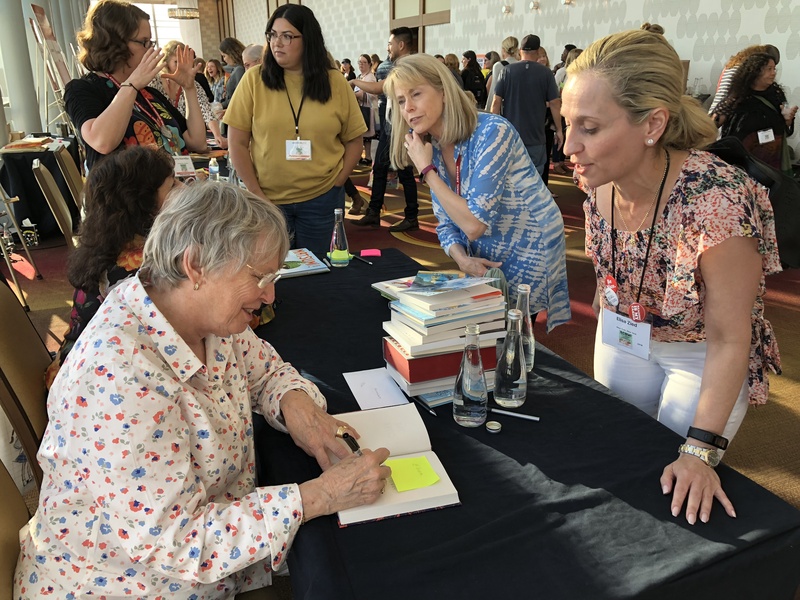 If you attended the SCBWI Summer Conference, what were your takeaways? 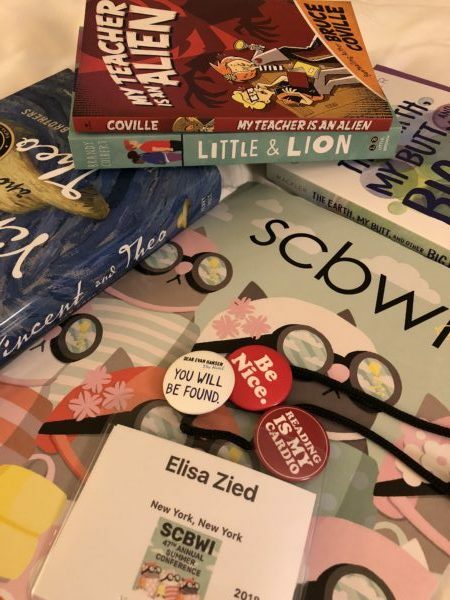 To learn more about the conference—and about SCBWI, an organization I’m SO proud to be part of—visit the website here.